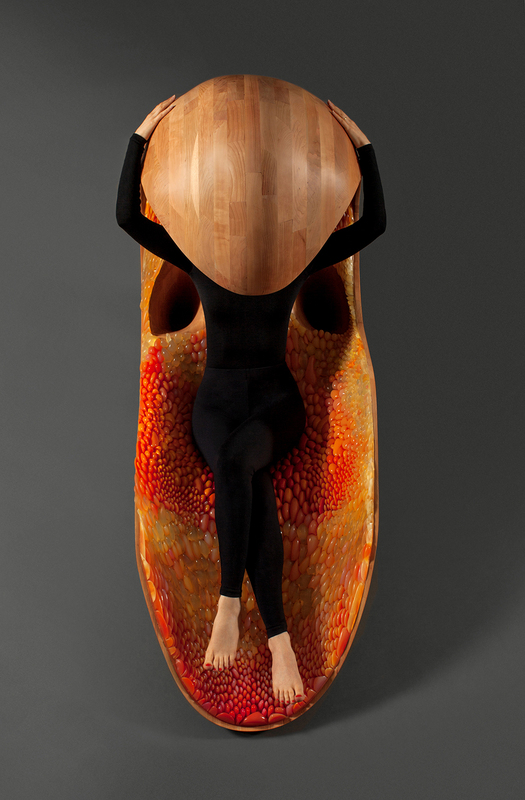 Gemini - an acoustical “twin chaise" - spans multiple scales of the human existence extending from the warmth of the womb to the stretches of the Gemini zodiac in deep space. It recapitulates a human cosmos: our body - like the Gemini constellation - drifting in space. In this project we explore interactions between pairs: sonic and solar environments, natural and synthetic materials, hard and soft sensations, as well as subtractive and additive fabrication. The design is rooted in the mythical relationship between twins; one is mortal - born of man, the other divine. Made of two material elements, a whole that is bigger than the sum of its parts, like the sun and the moon, like Adam and Eve, the chaise forms a semi-enclosed space surrounding the human with a stimulation-free environment, recapitulating the ultimate quiet of the womb as it echoes our most inner voices. This is achieved through the combination of a solid wood milled shell housing and an intricate cellular skin made of sound absorbing material. It is the first design to implement Stratasys' Connex3 technology using 44 materials with different pre-set mechanical combinations varying in rigidity, opacity and color as a function of geometrical, structural and acoustical constraints. This calming and still experience of being inside the chaise invokes the prenatal experience of the fetus surrounded by amniotic serenity, an antidote to the stimuli rich world we live in.